The Fancy Bandits are a three-piece band currently hiding out inside the caves and forests of Eugene, Oregon. With a musical treasure Map of sounds ranging from old world organ grinders to gothic contortions of the retro wurlitzer, Fancy Bandits take the listener to bizarre and fantastic dream worlds described by some as a "Tim Burton Circus." The Fancy Bandits: a trio of leather-and-feather- clad Super Heroines holding up trains and carriages on horseback, will grab your ear with captivating two-part harmonies, and steal your affection with their unique sound. Northwest. V and Gigi then met Emily West, Fancy Bandits drummer and singer/songwriter, in 2005 while she was performing shows with her other band,Telepathic Dumpster. Crossing paths over the next two years while sharing shows and participating in local music promotion, the 3 ladies finally took their first step into an all-female line-up in summer 2007 with the high-profile, yet short-lived five-piece, Sirens of Mothra. 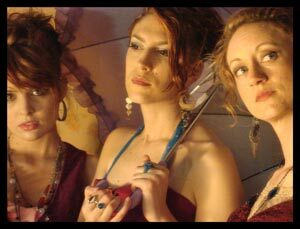 In early 2008, Gigi, Emily and Veigh began songwriting and jamming together in this current line-up, forming what is now the "Fancy Bandits."